The Newton Fire Museum on Spring Street. NEWTON – Members of the Newton Town Council were slightly closer to making a decision on Monday, Oct. 28, but not quite there yet, as they seek to make a final determination about the Newton Fire Museum. The museum sits in the historic Spring Street Firehouse, which was constructed in 1891 and from where the town ran calls through 1979. Mill Street’s Firehouse #1, is where those operations were relocated to, and currently houses the town’s ladder, rescue and pumper trucks. The Fire Museum houses antique apparatus and other treasures. One of the museum’s most recent acquisitions was the 1948 Mack 85LS, which made its way from Newton to Arizona to Michigan, and back again. Lakeland Bank helped to coordinate a loan for $56,000, for the Newton Fire Museum to “Bring Back Our Mack!” as the campaign states. 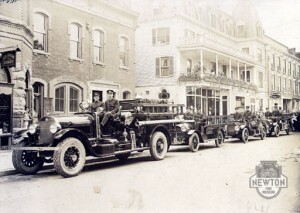 The Mack’s original home base was the Spring Street Firehouse. Now, the group is currently raising funds and seeking donations to pay off the loan for this important relic. The Newton Fire Museum is a 501 (c) (3) non-profit group, run by the Newton Fire Department. The Town of Newton oversees the Newton Fire Department. The fire museum has now been closed in excess of a year, to allow for renovations. The museum, according to notices posted on the wall outside, was anticipated to reopen in 2014. However, since the necessary refurbishment of the exterior walls due to water damage, and then renovations of the interior stairwell, another issue had been unearthed when the stairwell was demolished — a cistern in the floor that is 16 feet wide, by five feet deep. Some involved with the museum suspected a cistern might be there, but expected one much smaller in dimension. The dilemma has been, whether the renovations, including the filling in of the cistern, should continue, at a price tag of about $638,000 to finalize the project. Or, another option is to keep the historic face of the building, and then provide a completely new building behind it, to the tune of approximately $900,000. Or, does the town decide to sell the building, which, if selected, could be repurposed by the new owner into a for profit business, such as a themed fire department restaurant? The council, which had planned to review all options on Monday for a final decision, could not reach one, and plans to regroup on the issue by the next council meeting, at the end of November. Various options were explored and presented. The team of Newton’s Engineer Cory Stoner and Tom Kosten of FKA Architects presented the possibilities of having a museum on site of one of two other fire buildings, which are active stations. One at fire station number two (Woodside Avenue) was nixed, as it was not practical and would be cost prohibitive. In order to have the museum there, it would be necessary to construct a new building in the existing parking lot. However, the department would lose parking spaces, and possibly be required to park in the Dollar General Lot, which would not be a convenient option when firefighters are rushing to fire calls. Plus, the cost of a new building would run close to $1 million. The fire patrol building (Stuart Street) was a second and more plausible option, with some work required to build another bay to house equipment on display, and to revise the two current bathrooms on site into one unisex bathroom up to ADA standards. This would run about $116,000. Selling the current museum building itself would not, as the council evaluated, bring a great yield, as both the assessor and an outside appraiser said the building would require upgrades before sale, to further bring it up to par, and prepare it for the sale, which would entail about another $50,000 to achieve. The profit, after the upgrades, may be about $350,000. The town’s attorney, Ursula Leo, explained that if selling were the option, the sale would need to be advertised to the public, with price restrictions and a minimum threshold price. The town also has the right to reject all bids. However, the tug from a few on the council is that the fire museum remains at the original station where it is now housed. One member who strongly favored that idea was councilwoman Sandra Diglio, who first instead proposed sale of the fire patrol building in lieu of selling the current fire museum. Diglio inquired if volunteer sweat equity could also be implemented to save on costs. Mayor Joseph Ricciardo nodded in affirmation, although he pointed out an electrician would also be required for portions of the project. An historic photo in front of the Spring Street Firehouse, now the Newton Fire Museum. Photo courtesy of the Newton Fire Museum. “People can hang lights, drill holes in the studs, and pull wire,” he said, furnishing examples of tasks volunteers could undertake. Ricciardo asked if there would be room to store the relics at the fire patrol building, and Kosten said he was not sure how temperature sensitive the building was. He also asked volunteer museum curator Dan Finkle to research costs to relocate the items temporarily during the refurbishment. “Everything we do keeps multiplying our options, and I think we’re too optimistic on what our costs are,” said Newton Deputy Mayor Kevin Elvidge. Elvidge said the council has generally underestimated the actual costs for the project, and he felt, were more hopeful in terms of their projections on the sale. Diglio proposed performing the interior renovations over time. “If we’re going to sell it [the museum], it is going to be in a location not conducive to anyone,” added councilman Dan Flynn, who felt the fire patrol building was in a neighborhood that would not be a destination for many, lessening the foot traffic. Volunteer museum curator Dan Finkle said that when the museum was last open regularly, it attracted approximately 1,000 visitors that year. Ricciardo also proposed “biting the bullet,” and going forward with the reconstruction of the museum and bringing it to code, while keeping its original face. “Nobody sees the back end of the building, and if they do, they say it’s in terrible condition,” Ricciardo added. Flynn did not agree with that plan, as it would tack on in excess of $300,000, and took a more moderate approach, suggesting the group take the interior renovation portion of the project in stages, and raise funds for it. Councilwoman Kristen Becker did not offer her opinion of the project, but asked more about project status. Finkle shared with the council and members of the public who attended the meeting, a statement that he read during the public session about the fire museum. “Our accomplishments were only made possible because of the many local residents and merchants who support the museum and believe in its value to the town,” he said. Finkle recalled how recently, the committee that runs the fire museum, attended a conference in New York where those who run fire museums around the country gathered. After speaking to a curator from the Smithsonian Institute, Finkle said the curator offered to help coordinate the reopening of the museum at a professional level. “Having this kind of support from a museum professional at the Smithsonian gives us a running start for our re-opening and validation that our goals are attainable and worthwhile,” he said. Finkle expressed concern about the possible sale, referencing comments on an article about it in The New Jersey Herald. Although one comment appeared Harsh to Finkle, though he noted it had the most ratings, it read that if the town was not willing to invest in the one building it owns on Spring Street, why would anyone else? Finkle said the building offers its utilities during public events, such as electrical during events such as the Taste of Newton. The water is used by the DPW to power wash the sidewalk, and for the Chamber of Commerce to water the flower baskets. The apron of the building is the spot used for the band on sidewalk sales days, the reviewing stands for the parades, and photos with Santa during the holiday parade. He also said how the museum’s presence provides for “tougher penalties for drug distribution,” if it occurs within proximity of the building. In the meantime, the contractors will be notified to proceed with the initial phase one of the project, which they have been in a holding pattern on. That would entail finishing the outside wall. The cistern and interior issues would be addressed at a later time. The cost to remedy the cistern will run about $50,000. “We’re going to have to make a decision tonight or in the very near future,” Ricciardo said. Thomas S. Russo, Jr., Town of Newton Town Manager, spoke to NJ Inside Scene on this topic recently. “This has been a very thorough analysis,” Russo said. Readers, what is your take on this topic? Please respond with your feedback in our survey below.